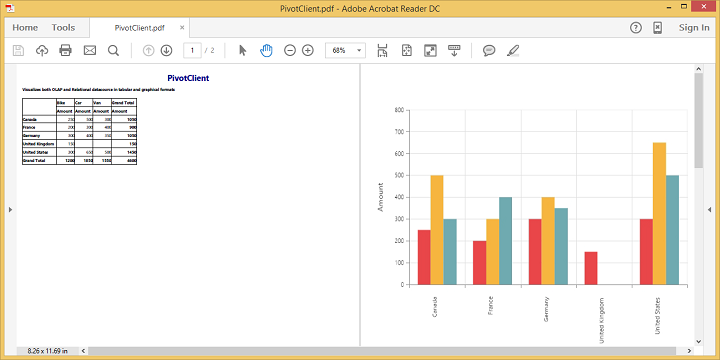 The chart and grid in the pivot client widget can be exported to Microsoft Excel, Microsoft Word, and PDF documents by clicking the respective toolbar icons. ChartAndGrid: Exports both pivot chart and pivot grid controls. This is the default mode. ChartOnly: Exports the pivot chart control alone. GridOnly: Exports the pivot grid control alone. By default, exporting is done with the use of JSON Records, which is maintained in client-side for both client and server modes. Make use of the exporting with the client side JSON data. The control can be exported by invoking “BeforeExport” event with an appropriate export option as a parameter. When the pivot client is exported in JSON export mode, a server-side event method should be added in the code behind file of the application. This feature is applicable only at the server mode operation. This option is applicable only for PivotClient when exporting to Excel document. You can set the option for exporting the control to Excel document either in .xls or .xlsx format, using fileFormat property inside the BeforeExport event. By default excel document will be exported to “.xls” format using PivotEngine export. For customizing name in the WCF service, the following code snippet is used. 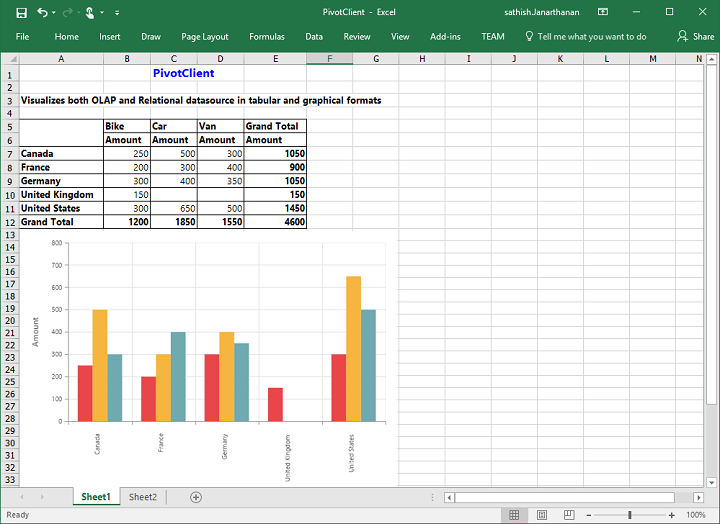 This option is applicable only for PivotChart in PivotClient specifically when exported to Excel document. You can set an option to export PivotChart to an Excel document, either as image or PivotChart format itself by setting the boolean property ‘exportChartAsImage’, inside the before-export event. 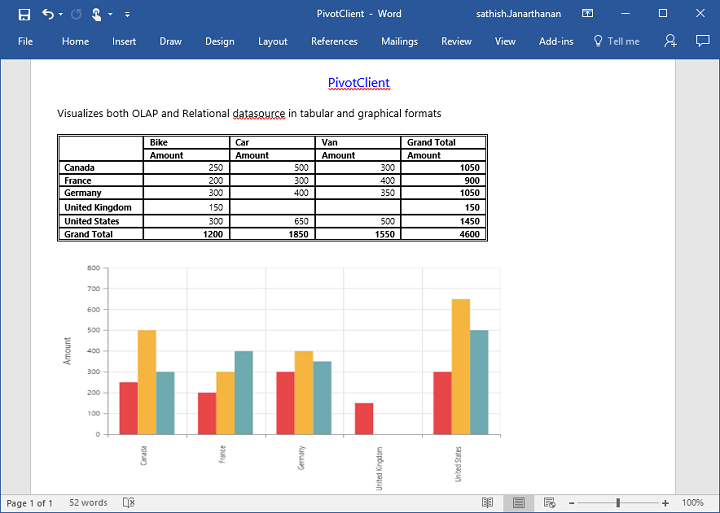 By default PivotChart will be exported as image format to Excel document. 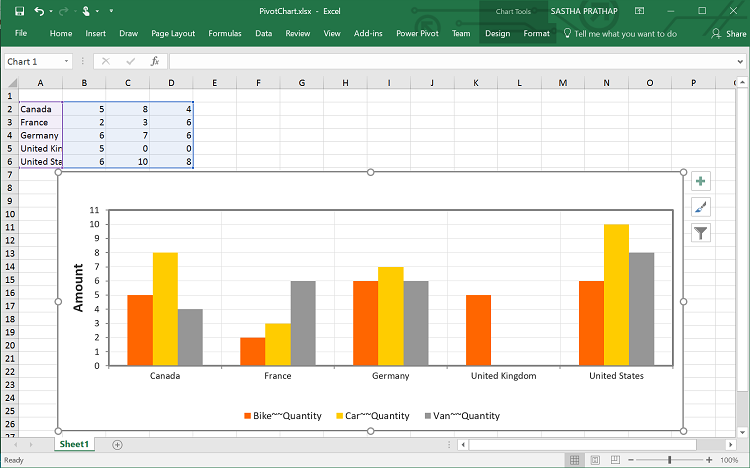 The below screenshot shows the control exported to Excel document showing its own format (Pivoting Chart). You can add the title and description to the exporting document by using the title and description property obtained in the “BeforeExport” event. args.exportWithStyle = true;   // by default it sets as true. It improves performance on exporting huge data when it sets as false. You can also edit the exporting document by using a server-side event for the required exporting option. //You can customize exporting document here. //You can add header/footer information to the PDF document.